Monday I spend the day at the lifeboat station in Gorleston, Norfolk, assessing the crew. We do some chart work, planning a passage between two different ports. 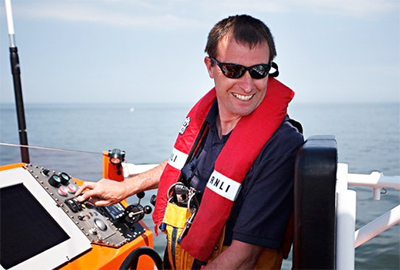 If you join the RNLI as volunteer crew, it takes months, perhaps years of training. Tuesday I update the Gorleston training records, then head to Happisburgh Lifeboat Station to assess the shore crew. I get the volunteers to launch and recover the boat with a tractor and a trailer. At Happisburgh, they do this across an open beach that is really busy in the summer. Lifeboats and tractors are like magnets for children so they have to be so safety conscious. I carry out fitness tests on the sea-going crew. I return home after 10pm, which is not unusual if you're involved in lifeboats. Wednesday My pager goes off as I'm driving my wife to work. She gets out of the car and I rush to the lifeboat station. We launch the boat by 8:40am. Our first coxswain is a fisherman and he is out at sea; as second coxswain, I'm the volunteer in charge. We evacuate an injured worker from a gas platform. After lunch, I drive to Hull to meet my line manager and another colleague. Thursday I head to Humber Lifeboat Station at Spurn Point. Humber is an unusual station: it has a full-time crew because it is so inaccessible. I meet a new trainee coxswain with whom I'll be working over the next six months. At lifeboat stations, you're always looking to the future and thinking about when your coxswain might retire. I drive back to Wells to do some crew assessment. I try to adjust what I do to the differing abilities of the crew. They come from all walks of life and might not know how to do computer-based tests. I get home at 10pm. Friday I catch up on some admin and then take my daughter out to buy some kayaks. We've always had boats in our family. Then I plan ahead for the weekend. Saturday is family time but I always try to always keep Sunday mornings free for my RNLI volunteering. This Sunday I'll be at the boathouse at 9am for an exercise.